a step-by-step method to identifying and fixing a novel's weaknesses, and then completing the work in a reasonable timeframe. subplots become richer and contribute far more to a story. This is not a book for the faint-hearted. Ray's rewriting method may seem to some to be prescriptive and mechanistic, and it is certainly boot camp for the writer who has never previously attempted a rewrite. Over eighteen weekends (that is, four and a half months), a writer can carry out the work necessary for an effective rewrite of a novel, and have the manuscript ready to go. Most manuscripts benefit from being redrafted before they are sent out to agents or publishers. It's a chance for the writer to reassess the story, to see what does and doesn't work, and to try to fix the problems. Yet, it's a daunting task, even for an experienced writer. Most people don't really have much idea how to tackle the job; as Robert J Ray notes, they start at the beginning, tweak a word here, a line there, juggle a couple of paragraphs, lose interest, feel overwhelmed. Beyond that, most writers really don't have much time at their disposal for rewriting when they're much rather be moving on to the next story. Robert Ray's book is intended to address all these problems, and provide the writer with a step-by-step method to identifying and fixing a novel's weaknesses, and then completing the work in a reasonable timeframe. Ray's key point is that rewriting is not about dealing with words but about working with chunks of novel, and his method is very focused on breaking a novel down into easily manageable chunks with which to work. Thus, the three important elements of a novel for him are Story, Structure and Style, of which style is the least important. You fix the story first and worry about the words later. Much later. Within Story, Ray argues that while everyone focuses on the main action, the key to a good, strong novel lies in working the subplots, because that is where a novel's detail comes from. Consequently, a writer's first job when rewriting is to read the novel, identify the subplots, draw up a chart, and then work through each subplot in turn and flesh it out. Proper planning and research is very much at the heart of everything, according to Ray, so his method relies very heavily on making lists, being clear about who everyone is, and what needs to be done with them. Ray also believes that establishing backstory is an important part of effective rewriting, and his preferred method for dealing with this, and indeed for dealing with all aspects of exploring the novel's mechanics, is timed writing, a technique he learned from the author and teacher, Natalie Goldberg. Through bursts of timed writing, a writer can get to the heart of what is going on with a character and their story, as a result of which subplots become richer and contribute far more to a story. Ray employs the same methods for isolating and dealing with key scenes in the novel, ensuring that the story is properly paced to hold the reader's interest throughout. As well as using timed writing, and encouraging the writer to examine and code the elements of the novel, to be clear about what is and isn't working, Ray also turns to script-writing for further inspiration. He is strongly of the opinion that understanding the craft of script-writing can be helpful to novelists in terms of understanding how individual scenes should be structured, and how a story arc can work most effectively, and devotes a significant amount of the book to analysing the structure of various well-known films to show how story-telling lessons can be derived from them. Finally, Ray shows how to polish the novel's style through thorough line-editing and the careful selection of words. This is not a book for the faint-hearted. Ray's rewriting method may seem to some to be prescriptive and mechanistic, and it is certainly boot camp for the writer who has never previously attempted a rewrite. Ray is a hard taskmaster. Having said that, it is for precisely these reasons that an inexperienced writer is likely to find his advice so very useful. It may be that with time, an author will refine his or her practice, finding the tricks that work best while discarding the others, but for the first-time redrafter, Ray's methods provide a good foundation, and most importantly, they use a clear timetable. 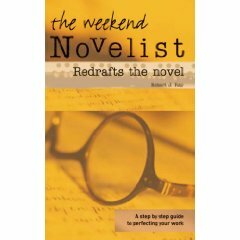 Over eighteen weekends (that is, four and a half months), a writer can carry out the work necessary for an effective rewrite of a novel, and have the manuscript ready to go. Publisher s website Reviewed by Maureen Kincaid Speller a reviewer, writer, editor and former librarian, is our book reviewer and also works for WritersServices as a freelance editor.